Dreadnought: One of the largest presences on the show floor this year was the massive booth for Dreadnought, the upcoming team tactical space combat sim from Yager Development and Six Foot. Hulking destroyers and frigates maneuver around the battlefield in a locked deathmatch, while small corvettes dart around terrain, hunting for the powerful but fragile sniper ships. It takes a little bit of influence from everywhere: ships have unique and customizable loadouts, while abilities allow you to warp around, cloak or launch smaller fighters from bays on your ship. It’s also gorgeous, as the lasers and explosions of combat light up the battlefield and throw a fiery sheen across the metallic space hulks. Blade Ballet: The first title from DreamSail Games, a studio of both veterans and newcomers alike, is like Battlebots, but more cheerful and colorful. The bright gaiety is odd, considering it’s a couch multiplayer game about spinning your bladed bot around to impale other bots, but it works really well. Rounds are fast and intense, and there’s a lot of intricate dancing and weaving, as you try to jab into your opponents while not leaving the holes in your own armor exposed. Different abilities and weapons, like maces, lances and bombs, round out the selection to make for a really engaging local multiplayer experience. Rivals of Aether: Rivals is a distilled version of Super Smash Bros., made by a team who have played Smash both casually and competitively for years. With an expected eight characters, each one focuses on a different element and has a much more cohesive kit than other Smash games. Absa can make clouds with her neutral B, then launch lightning in a direct line back to them wherever she is in the arena. Orcane makes ink puddles, which he can teleport into using his Up-B special. Couple this with a removal of ledges, grabs and shields, and Rivals feels like new ground in an otherwise regimented genre, adding a greater sense of kit synergy, technicality and thoughtful play into the typical Smash set-up. Invisigun Heroes: This top-down multiplayer shooter has a really unique twist: everyone is invisible. The only hints you have to go by to hit your opponents are small glimpses when they shoot, use an ability or bump into terrain. It’s got style and charm, with a really well-made retro-pixel look and some really nice touches, like instant replay for the round-winning shot. Different abilities add another layer; the builder can make blocks that bounce back shots, and the teleporter can move and shoot between her two portals. It was a booth that was constantly packed, and for good reason, as it was hard to not go for round and round again on this game, which is currently campaigning on Kickstarter. With online functionality, tons of modes and new characters with new abilities on the way, this looks like one of the most promising multiplayer games of the show. Light Fall: An eerie, atmospheric platformer, Light Fall is built around building your own platforms. As you skip and hop through the air, you can summon a boxed platform below or to the side of you, or create one you can place and rotate. In some cases, you’ll be proceeding slowly and carefully, using your boxes to block lasers so your nameless protagonist can progress. In other cases, you’re hopping across massive expanses, using each of your three platform charges to traverse the vast distance between bits of terrain, just to recharge your platforms and start leaping again. It has shades of Super Meat Boy and Ori and the Blind Forest, with the graphic look of Limbo; despite any comparisons, though, Light Fall feels wholly unique because of its platform-creation mechanic. Definitely one for speedrunners and platformer fans to keep an eye on. Omnibus: Describable only as a bus-based physics game, you take on the role of the Omnibus and its vehicular compatriots as they solve the world’s problems. In one level, I was bouncing a gang of dastardly bus-bandits off the top of a plateau by ramming them at full speed. In another, I was driving up the side of a skyscraper to knock a giant monkey off of it. Throughout the game, bumpers, bounce pads and speed strips abound, creating either hilarious opportunities or ruining a good run. Either way, a simple press of the button instantly restarts the level, so you’re back in it and having fun right away. Multiplayer was equally ridiculous, having you and your friends ram each other around an arena to be the last bus standing upright. Those who love goofy physics and hilarious situations involving heroic buses, Omnibus has all that and more. Okhlos: Leading an angry mob on a rampage through ancient Rome and Greece is the crux of Okhlos, a game where your rambunctious crowd grows and grows to slowly topple their oppressors. Massive Centurions and evil magicians run around the map, acting as bosses in their own right, but you can constantly recruit the common people to your side to grow your forces, even adding philosophers and artists to the mix to buff your mob. Okhlos is simple, but effective at creating a mob game that captures the feeling of a million ants tearing down giants. The Final Station: One part The Last of Us, one part Snowpiercer, The Final Station is about a train travelling the tracks after a terrible catastrophe, which has reduced most of the world’s populace to zombies. As you stop at each station, you’ll have to scavenge for food and supplies, while trying to open the blockers stopping your train. Zombies abound, but you’ll need to tread carefully, as ammo can quickly become scarce. It’s a bleak, gloomy game that uses the atmosphere of the “last train running” to great effect. You’re always wary of what might be at the next station, what dangers you might encounter and if you’ll have enough supplies to even make it on to the next one. Enter the Gungeon: The roguelike has become a growing genre all its own, but Enter the Gungeon cements its place with a great setting and the sheer array of weaponry on hand. 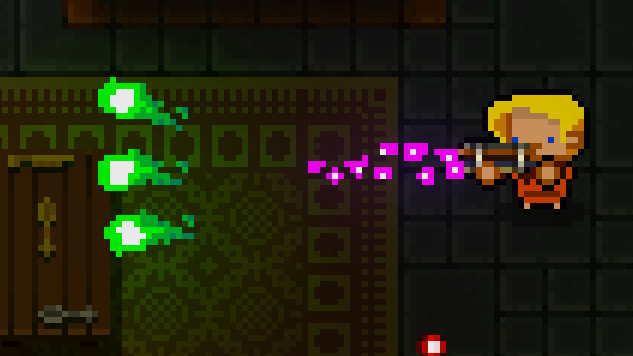 Enemies inside the titular Gungeon are all gun-based—bullets holding guns shooting bullets fill the rooms, as rolling sentient grenades pursue you. It can become a bullet hell as you weave between shots, blasting back with your own weapons, but dodging is made easier with dodge rolls and the ability to kick up a table, eating a few rounds while you fire back in reply. Guns range anywhere from individual-specific weapons like the Pilot’s laser blaster and the Hunter’s crossbow to rocket launchers and squirt guns. With all that and the addition of co-op play, Enter the Gungeon is looking to satisfy all the roguelike needs you’ll have this year. Stories: The Path of Destinies: After my time with Stories at last year’s Playstation Experience, I came away singing the game’s praises. After another demo, exploring more options and storylines, I can safely say this still remains one of my biggest surprises of the year. The way that Stories mixes action-RPG gameplay with an adventure game’s use of choices and storytelling is fascinating, and the combat feels smooth and fluid as you dash between foes, hooking them in and tossing them away, then parrying and slashing across the field with your elemental sword. The art style is gorgeous, both through the vibrant in-game scenery and the storybook cutscenes. Even slight alterations in my path changed events, from simple differences in tone to wholly different situations as Reynardo tries to find the right path to stop the Emperor and save the day. Marble Mountain: As a kid, I loved this small board game where you manipulated different knobs and levers to make a marble traverse across obstacles. Marble Mountain seeks to capture that same magic, but on a much grander scale. While it’s fun when playing it normally, the real difference for this one is in virtual reality, as you peer down into it as though you’re once again playing that old board game, moving sticks to roll happily along while gawking at all the machinations at work. Aiming for a launch alongside the Vive headset, Marble Mountain is definitely one to pay attention to if you’re looking to be an early adopter of HTC’s VR headset. Screencheat: Up to this point, the whole list has been games that are not released in a full capacity yet. I worked hard to keep that rigid line, but the one game I’m going to budge on is Screencheat. Out right now for the PC, Screencheat will be making its console debut later this year on PlayStation 4 and Xbox One. This is another title where every player is invisible, but to see where your opponents are, you’ll have to commit the cardinal sin of every GoldenEye and Halo LAN party: you’ll have to peek at each other’s sections of the screen. While the PC release has been excellent, consoles are the natural home for this title, where screen cheating has been rampant for years. Playing this on a literal couch at PAX was quite memorable, as three perfect strangers and myself chided each other, peeking at screens and laughing the whole time as we killed each other with stick horses and blunderbusses. If you ever miss the old days of screen-peeking fun with your friends, Screencheat will soon be here to remind you that it’s okay to be the one that peeks. This year marked the second PAX South, and the sophomore showing of the Lone Star State’s new gaming convention was bigger and better in every way. With more booths, more games, more panels, and more attendance than the year prior, both out-of-towners and Texas natives found a lot to love about the show. We took the time to tour the floor and demo as many games as possible, and, in no particular order, here are some of the best up-and-coming games to keep your eye on in the coming year.